McGary is projected to go late in the 1st or early in the 2nd round so he's probably there at #23 but won't be there at #54. I can see the Texans maybe trying to trade back a few spots or early in the 2nd to get McGary and pick up an extra pick. But, since there's not that many really good OT's in this draft, they may have to take him at #23. He's rated the 4th best OT just behind Dillard (If you go by Draft Scout's ranking) and judging by the article, there's a lot of teams looking at him. He's no Joe Thomas but he looks like he could be a good solid RT if Dillard, Taylor, and Williams are gone by #23 as expected. It could come down to Risner and McGary at #23. OptimisticTexan, CWTexansFan and Texansballer74 like this. So... If you had to choose between a talented right tackle that is expected to go late first, early 2nd, or an equally talented, but recently injured left tackle late 2nd or 3rd round, which would you prefer? LZ thinks he may have to move to G because of lateral quickness issues. Link. Had a heart arrhythmia. In recent years we have seen teams more prepared to "reach". My question is who will care if that player turns into a decent starter? The egg will be on the faces of the assessors but how often do we see that? Duane Brown was considered a "reach". He turned out ok.
OptimisticTexan, CWTexansFan and justmy2cents like this. By some drafniks. Then it turned out San Diego would have taken him with the next pick. Also turned out he, Clady & Long were the only successful OTs much less LTs out of 7 taken in the 1st & he is the only one still in the league. So I'm going with the draftniks were wrong and Gibbs/Texans right. ObsiWan, CWTexansFan, ATXtexanfan and 1 other person like this. OptimisticTexan, Texansphan, CWTexansFan and 1 other person like this. Overall I agree. But I am not & never have been a fan of Eric Winston. Maybe the best pure run blocker we've had... maybe. But worthless, imo, as a pass protector. I felt Newton was an upgrade. CWTexansFan, justmy2cents and JB like this. Gotta trust HOF'er Alex Gibbs. Much more tan I ever will Devlin. Give me Clady out of this yrs draft and I'm happy. CWTexansFan and justmy2cents like this. When perfectly healthy which was almost never, maybe. He played in 1 game last year. Winston played for 6 more seasons, 2 as starter (40 total starts) after the Texans. I think I remember you saying this before. As much as I enjoyed watching that line rumble to the right, opening creases for a galloping Foster, I can't envision a single pass blocking play on the right side .... maybe not memorable ? I absolutely do remember Newton however sprinting into the secondary and delivering an absolute pancake .... what a talent .... what a shame ! NO, No, No .... not Newton .... Charles Spencer !! OptimisticTexan and thunderkyss like this. I read somewhere yesterday where one assessor watched tape on all the top OL and he said McGary was the best run blocker in this class. Said he is an absolute bull. Only thing that takes his stock down a bit is his pass pro but these guys can learn to improve that part of their game. So for me, it's all about performance on the field. I'm sure if his heart murmur was a problem, his doctors would advise him to give up football. Those 32" arms are a total no go. From the all the sources I've been able to put together, his underlying presentation was atrial fibrillation............with an atrial response of 300/minute (this is much higher response than his actual heart beat which is normally 60-100. The atrial response normally acts as a trigger for a ventricular contraction (the actual heart beat). 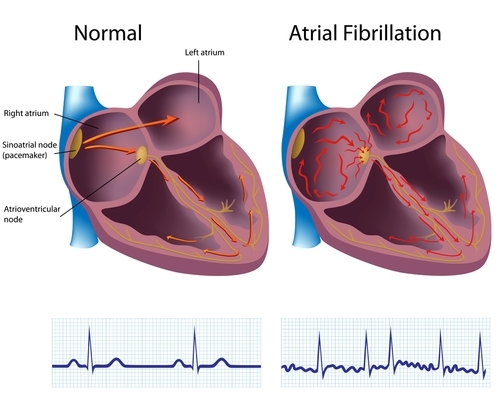 With atrial fibrillation, there is a disconnect between the atrial firings and the ventricular contractions............so the heart beat becomes very erratic.............and therefore is not able to pump blood and oxygen to the brain. When the brain does not have continuous oxygen supply, passing out occurs. Such an episode occurred during a basketball game in which he passed out...............that is what alerted his physician to begin a cardiac workup. The first cardiologist stated that a faulty mitral heart valve was causing his atrial fibrillation and that he needed a mitral heart valve replacement...............and would never again play football.........the family bucked the recommendation. The next cardiologist found that there were multiple areas in the atrium of the heart...........multiple abnormal trigger points for the atrial response...................there is usually only one trigger point, i.e., the sinus-atrial node, that sends a message to the atrial-ventricular node, that triggers the ventricular heart beat. Therefore, an ablation (destruction) of these trigger points was performed. It is not unusual that all of the trigger points are not identified and destroyed. Such was his case, where it required 3 such ablations to successfully treat him. As there has been no further episodes since 2016, it is unlikely that another underlying cardiac abnormality is present. There are no guarantees in life, but it is unlikely that he will ever be faced with this problem again. CWTexansFan, JB, CloakNNNdagger and 1 other person like this. Feel like I can perform open heart surgery now. Thanks Doc. steelbtexan and CloakNNNdagger like this.